Wow, where did April go? 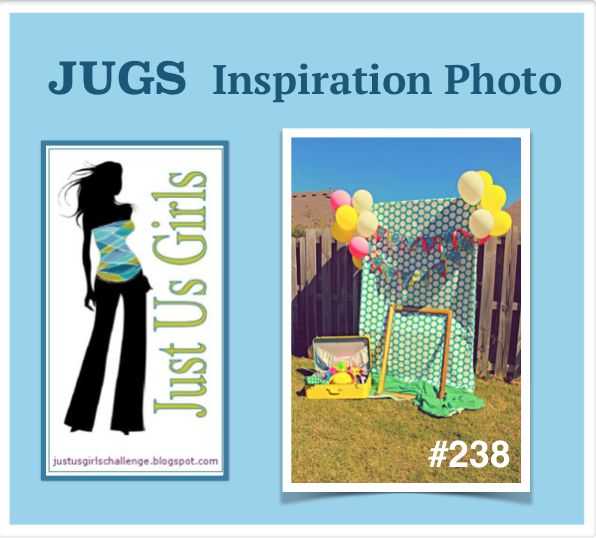 I’ve had so much fun as the JUGS (Just Us Girls) Guest Designer this month and really sorry to say goodbye! What a fabulous inspiration picture we’ve got to work with this week!!! So many options for designs. Thought I’d have fun doing an acetate card for a change. Each of the balloons is die cut twice in coordinating papers. So is the banner, but one is cut backwards (i.e. the wrong side of the paper). This is so you can match up the front to the inside of the card. Once those were cut, the sentiment was stamped on one of the balloons and highlighted with Wink of Stella. Same goes for the little black stars on the banner. Just couldn’t get the right shot to show the pretty shine. I added a bit of hemp twine to each balloon and attached the balloons to the card base with Scor-Tape. The balloon with the sentiment has been popped up with clear foam tape, and there’s little bits behind each of the banners too. 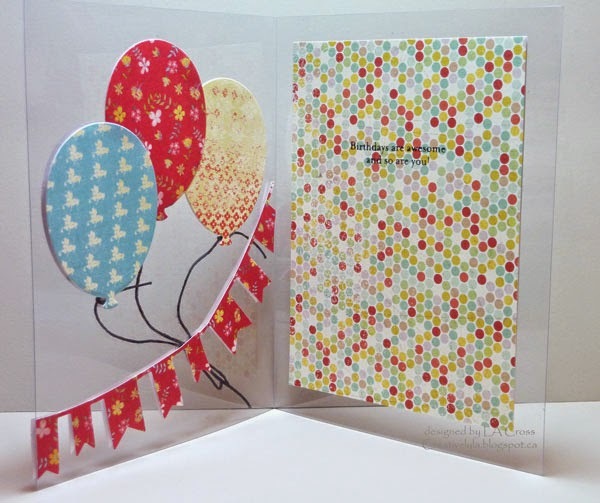 Pasted the same three die cut balloons and the banner directly behind the ones on the front of the card. Then I cut another piece of coordinating paper for the inside verse. You will see a bit of the banner or balloons from the inside depending on the angle you look at the card. There’s one more piece of plain white card stock on the back of the card too. Vicki and Lisa…thank you so much for this opportunity. Each and every member of the designer team is so talented and so supportive…I’ve loved being the Guest Designer this month!!! Love your clear card Lee-Anne! The dp balloons are perfect for it! You have been an outstanding GD!! This is fabulous! I love acetate cards and love how you created this one! Thanks for being such a great guest this month! We hope you play along with us in the future! How very creative! It turned out beautiful. I like how you did the DP as the background inside. I love the use of the clear card for your design! Fun balloons and garland, love that you did the back side of them the same as the front, great touch. It's been really great having you as our Guest Designer this past month and hope to continue to see you take part in our challenges. This card is brilliant! I love acetate cards! Glad to have had you as a guest designer! Oh my gosh, I love this on the clear! So beautiful! Lee-Anne….Beautiful card to end your month with us at JUGS! We so enjoyed you…you were a fabulous Guest Designer…… thank you so much!